There is a lot of talk about on-line retail dominating the traditional retail in India. Some have even gone to the extent of saying that on-line retail will eventually kill the traditional retail in this market. 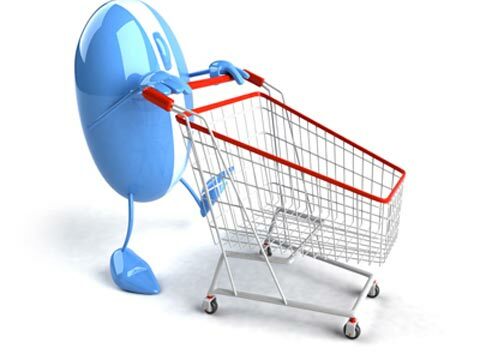 There is a lot of talk about on-line retail dominating the traditional retail in India. Some have even gone to the extent of saying that on-line retail will eventually kill the traditional retail in this market. Fortunately, such prophecies could not be further away from the truth. While the on-line retailers have recorded an explosive growth and is on track to keep growing very rapidly, the traditional retail has also been quietly nothing up impressive growth numbers. Not only that, spurred by the rapid growth of our economy, the entire retail market is set to grow very rapidly as well and in context, both organised retail and on-line retail together represent a paltry 7.5% of the estimated total retail market in the country. A closer look at the numbers and a study of projections by many seems to indicate that both these forms, organised retail and the on-line retail together will still constitute just about 11% of the total retail market in the country even in 2017. Consider the some of the indices as reported by key malls in the country where the growth augers seem quite impressive. We compared the key months where the on-line retailers recorded a very high growth during this festive season. The numbers clearly indicate that customer’s preference of malls has only increased over the last year. To be fair, this also takes into account that a few new malls have opened up in each of these areas around the same time that all the new on-line retailers made their presence felt to even out the game. Similarly, the growth of cars to malls also recorded impressive increases and went as high as 25% in the south while the north recorded an 18% growth in October 2014 when compared to the same month last year. The growth in the numbers of two wheelers was even better for the same period of comparisons. The key index that merits a closer look is the consumption across these centres. 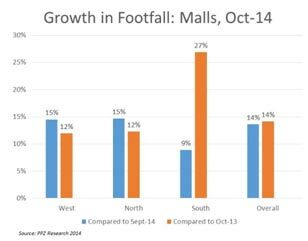 While the total consumption across key malls in the north jumped by a whopping 41% in October 2014 when compared to the same month last year. 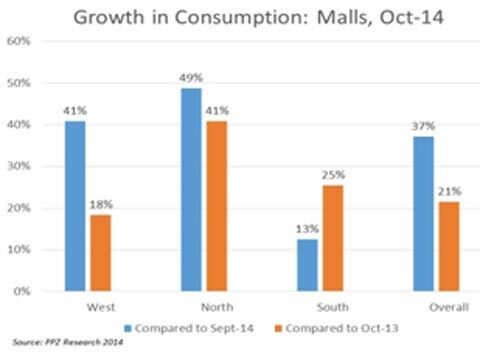 This consumption growth at organised centres seems to be echoed across all regions. So where is the catch? 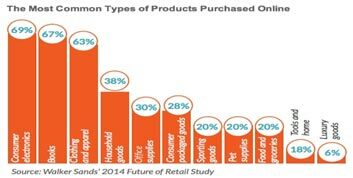 The popular on-line products and merchandise are typically offered by stores occupying around 10% of a mall. Some e-tail offerings are still a long way away from being popular on this medium and malls are preferred by a large margin. Moreover, some categories as Food and Beverage and Entertainment are unharmed and will be untouched by this channel of retailing. Indeed, the space occupied by such retailers in malls has been growing steadily from an average of 25% about 5 years ago to almost 35% in the newer malls and organised retail spaces today. Retail sale thru on-line Medium: McKinsey, Crisil. The on-line channel represents just 0.5% of total retail in the country today. Even in a developed economy as the USA where the organied retail constitutes 88% the on-line retail is still at just about 9% of the overall retail per research by Crisil and McKinsey. That is approximately 11% of the total organised retail market as compared to our country where on-line retail is at about 7% of the organised retail. The China market perhaps merits a closer look, a market that has gallopped away and made huge strides in the last two decades and is said to have some parallels with our economy. While the organised retail in China is approximately 25% of the total retail, the on-line retail is at 6%. The trends and all data indicate that the growth of retail across channels will be spectacular in the coming years in India. 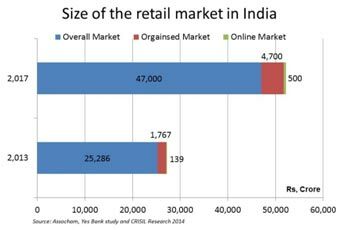 While the retail pie size in India is growing rapidly, the organised retailers and the on-line retailers are projected to grow much faster. And it is certainly nowhere near a zero sum game in any part of the world between traditional retailers and on-line retailers. All in all, some great times for the Indian consumer!